A soap-free liquid cleanser that transforms into an airy foam for a pleasurable, gentle cleansing experience. A naturally effective blend of grape extracts, sage, and chamomile provide vitamins, purifying benefits, and soothing effects, removing makeup and impurities while improving overall complexion wellbeing. From the first use, the complexion is immaculate, toned, and radiant. This delightful wash works for all skin types, and is especially tuned to the needs of combination and sensitive skin. Not tested on animals and environmentally friendly! The magic pump which turns everything to foam! Press the pump gently as it might dispense a lot of product if pressed too hard. Soooooooooo Foamy!!! It looks like cream and is very soft and nice to touch. 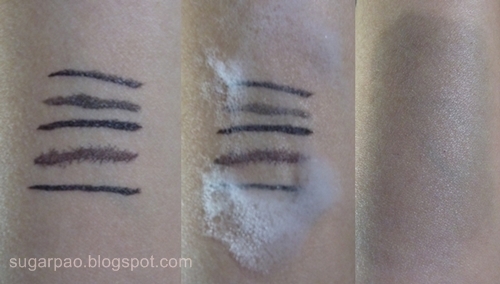 Below is a demonstration of how the product removes a bunch of waterproof eyeliners. 1. Swatches of different eyeliners. 2. Applied the foam on damp skin. 3. After gently rubbing the foam in circular motions. As you can see, it did not leave a trace of eyeliner. BUT WAIT!!!! Note, this may not remove all sorts of eye makeup especially those that are waterproof. The result may vary when it is tested out on a flat surface and the actual eye. - I love how foamy and airy the product is! It goes on smoothly on the skin. - Feels light on the skin. - Very gentle on the skin. - Removes makeup quite well as you can see from the picture above, but it will not remove waterproof makeup. - Does not strip my skin of it's natural oils nor make it dry. - Did not break me out. - The product works as a cleanser it did not improve my skin nor does it make my skin brighter when I use it. This is a good product but it does nothing for my skin. I suppose it can do wonders for other people, sadly, I am not one of them. I will continue to use this but will not repurchase. Note: I use this interchangeably with Paul & Joe's creamy face wash, Nivea Visage Sparkling White - Whitening Cleansing Foam and Philosophy's Purity. This product reminds me of Etude House - Cloud Bubble Oil which is a lot cheaper. The only difference between that and this one is that this one doesn't strip my skin off its natural oils.